It is with great sadness that we announce the passing of legendary civil rights activist Julian Bond, SPLC's first president. He was 75 years old and died last evening, August 15, in Fort Walton Beach, Florida.? I hope members of this list will not mind if I quote the last stanza of Stephen Spender's fine poem, "I Think Continually Of Those Who Were Truly Great." Doing so will make me feel better. Maybe some of you, too? As they say in Africa, a tree has fallen! As you must be doing, still trying to digest this news. I was out for a walk very early, here in Atlanta, with my youngest son. For an hour, we talked about Horace Mann Bond, black literacy, the state of Tennessee, SNCC's legacy ("Mom, don't assume that I learned by osmosis! "), and what it means to stand (tall) for public office. "A Great Leader Among Us Has Passed"
Curse, bless, me now with yours fierce tears, I pray. Let us continue in his footsteps! I recollect Julian's stubborn bravery as he, in early 1966, supported fully SNCC's anti-war statement and then faced the hostile Georgia legislature and demanded they seat him. That's when he became a national, indeed an international, figure. He was there on every issue of importance. He made everything (and everyone) he touched, better. The sudden loss of Julian Bond is stunning and historic. One of the founders of the SNCC, the late James Forman recruited him for SNCC when he saw from his resume that Julian was a journalism major. Eighteen months later I was also recruited by Forman because of my photo journalism. Julian and I shared an Atlanta office where we joked about being the Ministers of Propaganda. Luckily for me, I would know this person in a very special way for over fifty years. We sorely grieve his passing, yet the brilliance of a Julian Bond lives long after him. The new radicals, and there are myriad, "have absorbed" the things he fought for and many of the things he was. A few years ago when we had lunch in Washington, I talked about wanting to record the voices of old revolutionaries when he said, "I'm not a revolutionary any more." But he was one when it mattered, and his radicalism helped change the world. Actively denouncing the war in Vietnam, hardly the bailiwick for a founder of the fight against segregation (successful) and black voting rights (successful), he had the incredible guts to run for office in deep south Georgia and was blocked from being seated in the Georgia State Legislature because of his early and loud denunciation of the war in Vietnam. That attempt was unsuccessful as the Supreme Court seated him in the Georgia State Senate where he was greeted with boos. Our friendship was based on our radicalism, our interest in arts (Julian was also poet) and our position in SNCC as journalists. Neither of us were supposed to get arrested and didn't. Together with Dotty Miller, we made the posters and pamphlets which today are one of the few material objects left by SNCC. Years later when he asked me to speak to his class at Williams College, he asked if I had any pot, for that too had been an early bond. And told me he "never closed the door" when he had a student inside his office. Because of gerrymandering, there are very specific districts in the South that could elect a black. So in Atlanta Julian was forced to run against his long time friend, the ex-SNCC Chairman John Lewis for the seat in Congress. Julian lost, a profound loss for this country. Had he won, he might well have reached the Senate and had the bully pulpit this country so desperately needed to hear from. Julian told me that when Obama was elected he cried. He called it the greatest event of his lifetime. He cried because Julian was so Obama like, more than a generation ahead of time. His charm and brilliance were devastatingly effective in the cause of human rights. Our last meeting was at the National Geographic Society in Washington where we sat together on an illuminated stage both of us wearing tennis shoes trimmed in pink. By then we were in our seventies. In front of the cameras, he recalled first seeing me walk into the SNCC office when he said he noticed my "Jewfro", referring to my big pile of dark curly hair, and I snapped back, "Watch it!" There was more of SNCC in this exchange than usually reaches the world from two men with white and gray hair. Now he is gone. Or is he? The phone rang one afternoon in Mississippi. I picked up and Julian Bond was on the other end. He asked me to come to Chicago the National New Politics Conference to be held in Chicago. With the goal of bringing together diverse activists from across the country, he said he had invited Chicano Land Grant leader Reies Lopez Tijerina to the conference. He was worried, however, that Tijerina might not feel comfortable... "I don't even know if he speaks English" he said. Would I come and act as a sort of hostess to help him navigate the conference. That invitation changed my life. After agreeing to the invitation I spent a good deal of time with Tijerina. Several months later Reies wrote: "I would like to say that it would be very nice if you would come to Albuquerque and spend some time with your people" Forty-eight years later I'm still here, taking SNCC's lessons and transplanting them to other venues. I worked in the SNCC office in Atlanta in the 1960's. Julian's office was next door. He was one of the most dedicated freedom fighters I knew. He was also an internationalist, openly opposing the U.S. imperialist adventure in Vietnam. He was a "commentator" on a panel I attended, in Birmingham, Alabama a few years ago. It was to be a discussion of Martin Luther King's famous "Letter from a Birmingham Jail," wherein Rev. King criticized a group of white clergy who, altho they detested segregation, would not aggressively criticize the powers-that-be (young children, opposing segregation, were filling the Birmingham jail) . The son of one of these clergy (all the clergymen had by then passed away) was on the panel, and I had learned he would vigorously defend his father. So Julian and I had a phone conversation a few days earlier, and I told him I would blast these sanctimonious hypocrites. Julian responded that, as a panelist, albeit commentator, he would stick to his narrow role. But, he said, if I would raise hell, he would speak to it directly. I raised the holy hell, and Julian did in fact speak to it. Of the many people I knew in the civil rights movement, Julian was one of the nicest and most pleasant to be around. He had a wicked sense of humor. One day in 1967 or so, a group of us were sitting around the SNCC office in Atlanta and got to talking about what we would do if slavery came back. After much conversation and a lot of laughter, Julian said, in his quiet voice, "If slavery comes back, I'm going to buy Ray Charles." As is obvious from his speeches, he was a wonderful writer, and, if he had chosen, would have made as equally an important contribution with his words alone as he did in the path he chose. Julian Bond died last night. Bob Zellner got an email from him just the night before. Julian and I worked together at the Atlanta SNCC office in 1962 & '63. He was Communications Director and I was a white volunteer. We were 22 and 20. 50 years later, last summer in Mississippi , we got to say our last "hellos." Julian and I were both raised in upper-middle class families and found ways to do some good work over the years. Julian, I send you love as you make your latest journey. It is with a sad (he is has his transition) and happy heart that I remember Julian. He was here in Montgomery for the 50th commemoration of the Selma-to- Montgomery Voting Rights March. After the Freedom Fest Concert with Mavis Staples, I met Julian and his wife in the spacious lobby. We exchanged a warm greeting when Julian whispered in y ear, "Gwen, where's the bathroom?" I beckon a brother to excort him to the facility. After, Julian returned to the lobby. It was clear that concert patrons were in awe of Julian as I approached him again, and asked, "Julian, these people would love to have their photos taken with you." In his usual gracious manner he consented. He would have stayed forever if I looked at his wife to convey that she should move on to their hotel room. Jan was not walking that well. My last exchange with Julian was at the evening showing of the Fannie Lou Hamer documentary, "This Little Light of Mine," last month when he jocularly congratulated me for having been thoughtful enough to bring my "daughter" with me for such a special occasion. Of course the daughter he knowingly referred to was none other than my bride of more than fifty two years! He was no doubt facetiously remarking on the fact that the doves have now won a super majority over the ravens in the parliament of my hair — Always the wise-guy, willfully poking fun at his "elders." The very first exchange we shared was when he testily wrote to me on SNCC stationery at my Jackson Mississippi address in the early sixties demanding the reasons, date, grounds, and bail requirements on the arrest of Jesse Harris for his local voter registration activities. And, moreover, he wanted to know "why in the Hell no one in Jackson had let SNCC in Atlanta know about it," without having to be asked. — Always the task master for details and not yet mellowed into an indulgent wise guy. Where, my friends, shall we find the likes of him again? Because he believed in freedom, he would not rest and neither would he let us rest, 'til victory had been won — in other words — never! His footprints offer a mighty challenge for those youngsters who would come after him headed in the same direction. ATLANTA....On August 15, 2015, we in America witnessed the passing of Julian Bond who was a beacon of light, a messenger and worker for justice. The Federation of Southern Cooperatives/Land Assistance Fund (Federation) acknowledges in appreciation the breadth and profound work, as well as advocacy, of Julian Bond throughout the South in both urban and rural communities. In fact, throughout the country it is acknowledged that Julian Bond articulated the vision and need for change in America and then worked diligently to accomplish precisely that - change. "When the history books are written in the future, somebody will have to say, 'there lived a race of people, a black people' who had the moral courage to stand up for their rights. And thereby they injected a new meaning into the veins of history and civilization." Bond said further that, "King was the most famous and well known of the modern movement's personalities, but it was a people's movement. It produced leaders of its own; but it relied not on the noted but the nameless, not on the famous but the faceless. It didn't wait for commands from afar to begin a campaign against injustice. It saw wrong and acted against it; it saw evil and brought it down." Much of the focus of Bond's renowned contributions is largely, and importantly, centered on his role in the founding of and leadership with the Student Nonviolent Coordinating Committee (SNCC); and his leadership in the NAACP, as well as the Southern Poverty Law Center. We at the Federation will add another important aspect to his long list of achievements, however, and that was his advocacy and support of the creation of economic independence of and by the Black community. Bond's statement perfectly emulates that of the Black community in the rural South, "It saw wrong and acted against it" and Bond was there to support these efforts." By 1965, "SNCC had built two independent political parties and organized labor unions and agricultural cooperatives....Unlike mainstream civil rights groups, which merely sought integration of blacks into the existing order, SNCC sought structural changes in American society itself." Not long after the creation of SNCC in the early 1960's, the Federation of Southern Cooperatives was created in 1967 and, in fact, grew out of the civil rights movement. As civil rights attorney J.L. Chestnut said, "There were many organizations that were spawned by the blood that was spilled on the Edmund Pettus Bridge in 1965, and the Federation was one of those." We do this with an active and democratic involvement in poor areas across the South, through education and outreach strategies, which support low-income people in molding their communities to become more humane and livable. We assist in the development of cooperatives and credit unions as a collective strategy to create economic self-sufficiency (Federation). In 1971 Julian Bond spoke at Federation's 4th annual meeting at Mary Holmes College in West Point, Mississippi. Charles Prejean, the first Executive Director of the Federation, worked closely with Julian Bond, during the initial years of the development of the Federation, from a base in a small office in Atlanta to a regional organization spread across the South. Prejean invited Bond, then a Georgia state legislator, with a national following, to speak at this important meeting. The photo below is instructive regarding the Bond's mission and SNCC over all, which included organizing work, of course, in rural Mississippi. 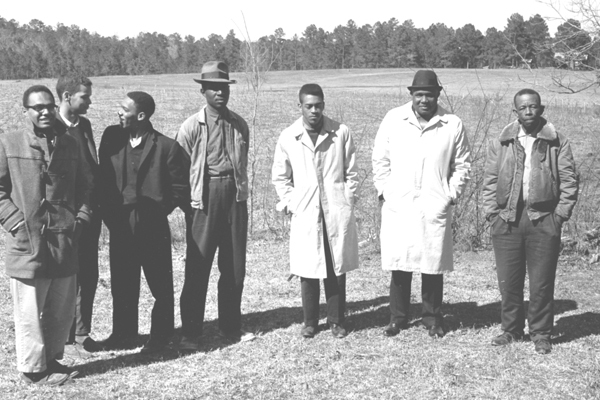 The photo above of civil rights and rural development activists was taken in 1963; Julian Bond is the second one on the left. This was 4 years before the founding of the Federation and 8 years before Bond spoke at the 1971 Federation meeting in Mississippi. To the far left in the photo is Mississippi farmer and cooperative leader E.W. Steptoe who was the creator of the "Miss-Lou Cooperative" in the late 1960's and who was involved with the Federation after its founding. Mr. Steptoe's family members are to this day supportive of and engaged with the organization. In the Federation's 25th Anniversary Annual Report, in 1992, is the following quote from Mr. Steptoe: "Our cooperative is like the railroad station in our community. It will be here, even if the trains don't come anymore and somebody far away decides to pull up the track, we will still have our cooperative in our community because we built it ourselves, no matter whatever else happens." Mr. Steptoe's message was echoed in much of Bond's organizing narrative. In 1971, for example, Bond spoke at both the Federation's annual meeting and at Tuskegee University emphasizing the, "Pressing issue of (Black's) controlling their ownlives." Julian Bond's leadership and advocacy was felt throughout the South. His support of the work of the Federation was on-going all these many years. He also helped lay the ground work for it all in his messages and rallying for support for cooperative economic development and economic independence. Another important connection to Julian Bond and his family was that the Federation's first attorney was Howard Moore who is married to Julian's sister, Jane Bond Moore. As we say, "The roots run deep." Working together in all these various aspects and areas helped strengthen the movement for change and empowerment. We are all eternally grateful for having had Julian Bond in our midst. One of Julian Bond's heroes, Frederick Douglass, died at 77 in his Washington, D.C. home, cared for by a loving wife and comrade. NAACP Chair Emeritus Bond died at 75. He leaves his loving wife, Pam, at their Washington home, along with his blood and Movement children, like me, across the nation, who have learned much from his example on the Long March for Justice. Douglass' (1818-1895) Long March began in the dangerous moral fusion abolition movement that led, in 1861, to the U.S. Government's organizing millions of Black and White families and soldiers to smash its sin and system of slavery in 1865. After a short period of exciting moral fusion advances in the 1st Reconstruction, Douglass watched with increasing frustration as southern states allowed racism to terrorize the new African American citizens with impunity. He joined the great cloud of anti-racism witnesses in 1895, and the next year the U.S. Government gave its full support to Jim Crow with its Plessy decision. Black southerners suffered egregious economic and social oppression for the next 58 years, until the NAACP knocked the legal legs out from under Jim Crow. Julian was 14 when nine white men in black robes declared Plessy unconstitutional. The Warren court, and every southern politician, knew this was merely the first step in dismantling America's apartheid system of segregation and gross inequality in education, employment, housing and health. Taking on this 2nd Reconstruction necessitated a second war, less violent, with the U.S. Government's commitment to this struggle decisively less unanimous than the Supreme Court's. The anti-racism nonviolent army of the south was led by citizen-soldiers who, like every army, were young. Julian Bond was 20 when he went to work with the Student Nonviolent Coordinating Committee — SNCC. Although SNCC had a few "elders" — Ella Baker, James Forman, and Robert Moses — in the main it was composed of young Black students from southern high schools and colleges. Hundreds of courageous young Black students from the south, joined by a few white southerners, served as the shock troops in the first battles, waged in lunch rooms, bus stations, and courthouse voter registration gauntlets. Young Julian's political analysis, his serious demeanor, his understanding of White-Black southern history, and his command of English quickly won him the job of SNCC's Communication Director. Thousands of news releases and political analyses flowed from the SNCC office in Atlanta. Since its field secretaries were continually being arrested, beaten up, and threatened with death, and they had sworn to forego the right to self-defense, Bond's ability to alert national television and print media to where people were being attacked probably saved many SNCC activists and grass roots leaders. When Black soldiers came home from from Vietnam home describing the atrocities they had seen the U.S. commit against the tiny country's non-white peasants, it was not long for Julian and SNCC to begin protesting these atrocities. Soon the Georgia Legislature, dripping with the money being spent by the U.S. military across Georgia, decided Bond's truth-telling could not be tolerated in the legislature and ejected him from his hard-won seat. Without skipping a beat, Julian and SNCC took the attack on him as an opportunity for turning the southern U.S. anti-racism movement into a southern hemisphere movement against the racist policies of the U.S. and European nations toward native, non-whites. With brilliant organizing and media work, complemented by a good legal strategy, the Supreme Court forced the legislature to seat one of the youngest state representatives in the country. Americans are the targets of a conscious dumbing down by tea party extremists, who are dependent on their twisted versions of world events and history. Their cruel policies would be immediately rejected if our kids were taught accurate history in our public schools. This problem led to Julian's full support of the Eyes on the Prize film. But it also makes it necessary, I believe, to preface any comments about his contributions to the anti-racism movement with a review of certain historical facts, to contextualize and provide an evidentiary foundation for the statements of praise and thanks I want to make about my beloved brother. I know Julian would have it no other way. After the 2nd Reconstruction was short-circuited by the Wallace-Nixon-Helms-Rehnquist southern strategy, Brother Bond, in 1998, was persuaded to lead 64 civil rights veterans who sit on the Board of Directors of the National Association for the Advancement of Colored People. Julian Bond never let us down in our efforts in North Carolina to revive SNCC's strategy of nonviolent direct action from the moral high ground. He gave us confidence to experiment with different ways to welcome our Brown and White sisters and brothers to the central struggle against racism. Yes, the "Black Power" slogan and its underlying theory was popularized by SNCC in 1966. But we knew it had been vulgarized by hostile national forces and media, and that SNCC itself always supported white allies, friends, and close comrades within the anti-racism movement. In 2006 we began building the Historic Thousands on Jones Street Coalition and Julian attended several of these annual People's Assemblies. He encouraged our State Conference to transform our once a year actions at the People's House into once a week actions, which the media called Moral Mondays. Now, Brother Julian, you get a well-deserved rest. You join the nine Emanuel Martyrs in the cloud of witnesses. We will keep alive your love, your humor, and your direct way of promoting justice, as we continue the Long March. You will be present within us as we walk in the NAACP's Journey for Justice through North Carolina on the way to D.C. to demand a comprehensive Voting Rights Act, that five Justices — liquidating history — eviscerated a couple of years ago. As the Journey passes ALEC's offices in Northern Virginia, a factory of poisonous boiler- plates of cruel laws for southern states to pass against the poor, disenfranchised, poorly schooled, LGBTQ, labor, immigrants, women, and every group of people excluded from accumulating capital in the avaricious economic- political system that is playing its trump card once again, you will be with us. We can hear you saying from the clouds: AMERICA. Shuffle the letters and you get: I AM RACE. Chairperson Bond ... You are Present. While I did not know Julian personally, I always admired the esteem with which you held him and often heard you speak on something Julian said, did or had you doing. My admiration and respect for all of you continues to run deep, for like Julian you did so much to change the political, policy and cultural landscape of the country and in some ways the world. I do recall how tall Julian stood for Angela, the San Quentin Six and so many others with the boots of oppression trying to stomp their lives. Through my daughter and I, my grandchildren are learning more about Julian Bond and what his legacy means to them and their future(s). In life's small world scenarios, my mom used to babysit Julian, Jane and James during the time Julian's father was president of Ft. Valley State and through educator Fletcher Henderson, his father has a deep connection to Cuthbert, Georgia where my father was born and grew up. I know as part of his legacy, you will continue to regale the world with your own Julian stories. I remain grateful to be part of this circle and continue to learn so much from each of you. On Saturday, August 22, 2015, Julian's ashes were scattered at sea. At the same time friends and colleagues joined them by gathering by a body of water where ever they happened to be to remember Julian. At 11:30 I pedaled the few blocks through Vancouver's Chinatown and skid row to a long wooden pier stretching into the waters of Indian Arm which extend far and wide into the continent and the Pacific Ocean. At the appointed hour of noon (PDT) I took out the sprig of black-eyed susans, just picked from our communal garden, and tossed the plucked bright petals unto the incoming tide. I kept the final stem with its single flower of yellow petals and black center intact for it seemed to symbolize the bond that I had shared with Julian. Watching the petals dancing on the waves reminded me on one of the last times I was with Julian. We were part of a panel in Salt Lake City to celebrate the publication and exhibit opening of This Light of Ours and in his talk, Julian noted that Snick had inspired the rise of so many other political and social movements. I jumped in with a fist raised in the air and hollered 'yellow power'. Julian, with his characteristic chuckle, replied that I had just written an autobiography called Soul on Rice. Brother Ed (Nakawatase) put it best when he wrote that with the passing of Julian Bond the circle has grown smaller but will never be broken. Tamio: It was isolating not being with any SNCC family in the scattering of Julian's ashes and spreading of flower petals ... but so many of us did something anyway. Thanks for your great email. Julian Bond's family scattered his ashes in the Atlantic today and asked us across the country to join them by scattering flower petals at the same time. Living in the desert, I found my bird bath the appropriate place to memorialize the scattering of ashes on this day, August 22, 2015. I met Julian Bond in the fall of 1963 at the Atlanta Headquarters of the Student Nonviolent Coordinating Committee. I was there to present a project to the SNCC Executive Committee that I had been asked to do in Selma, Ala. Julian didn't at first make an impression because of his self-effacing manner. It's hard to complete with such strong personalities as Jim Forman, Ruby Doris Smith, John Lewis and other SNCC leaders who were larger than life. But I began to notice him more and more because he would slip in a wise crack, joke, comment or observation that often diffused or brought a larger perspective to intense interchanges. It took time to get to know him ... but even with time, I don't think any of us really knew all that ran deep in him. He was good at reserving some part of his inner life to himself. Then in 1964, a burnt out SNCC staff were on an emotionally rugged retreat at Waveland Mississippi. In keeping with his role of 'engaged detachment', Julian took some of us to New Orleans. He knew a fish house ... perhaps it was in the 9th ward ... but was tucked away in an Afro American neighborhood. Sawdust on the floor, picnic tables with butcher paper and crab legs served in huge pots put right in the middle of the table with big pitches of beer. He held court at the table like it was his kitchen. Later he took us to see Black Orpheus ... it was my first 'foreign' film and apparently one of the many times Julian had seen it. His desire to diffuse the intense divisiveness of the staff retreat seemed to work: We went back to Waveland ... with somewhat improved coping skills. One of the life altering changes in my life was due to Julian. The phone rang one afternoon in Mississippi. It was 1967. I picked up and Julian was on the other end. He was in Chicago, co-chairing the National New Politics Conference. He asked me to come to the conference to help squire around Reies Lopez Tijerina, the leader of the Southwest Land Grant Movement. Julian, ever the solicitous, was worried that Tijerina might not feel comfortable ... "I don't even know if he speaks English" he said. "Would I come and act as a sort of hostess to help Reies navigate the conference?" That invitation changed my life. After agreeing to come, (who would ever turn down Julian), I spent a good deal of time with Tijerina. Several months later Reies wrote: "I would like to say that it would be very nice if you would come to Albuquerque and spend some time with your people" Forty-eight years later I'm still here, transplanting SNCC's lessons. In our elder years, Julian and many SNCC veterans, including myself, have gravitated towards young people to share our movement experience. We listen intently, as we were trained to do, to catch visions both spoken and unspoken. We speak, teach, and write our experiences, striving to underline the fact that the 1960's civil rights movement was primarily a movement of ordinary people. Most importantly we emphasize that to await the charismatic leader before changing oppressive conditions is to prolong powerlessness and dependence. Julian Bond was indefatigable especially in his middle to elder years in bringing this message to youth who are now the age we were when staffing the 1960's movement. He conveyed this message with a gentile civility evidencing his respect for younger generations. Eschewing the critiques, the put downs, the judgmental pointed finger at the millennials and Generation Z, (often painted as self-centered and entitled), he sought to create a relationship with his audience no matter how large the assembly or classroom. Julian is responsible for hundreds of young people across the country who feel a personal connection to our generation's movement work. Often the centerpiece of Julian's teaching was the Montgomery movement to desegregate public buses. Plumbing the deep and rich history of decades of civil rights activism in Montgomery, Bond pounded home the message that it was ordinary people who carried that movement. Martin Luther King was a relative newcomer. After earning His Ph.D. in Systemic Theology at Boston University in 1955, he arrived in Montgomery a few months later. King's background did not include organizing or movement strategizing. But his Montgomery mentors (some of them union members) had developed the strategies, communications and transportation infrastructure that made possible a 382 day long boycott of the city's bus system. Bond noted: "King was the most famous and well known of the modern movement's personalities, but it was a people's movement. It produced leaders of its own; but it relied not on the noted but the nameless, not on the famous but the faceless. It didn't wait for commands from afar to begin a campaign against injustice. It saw wrong and acted against it; it saw evil and brought it down." In a recent interview with his grandson ... Julian captured what we, his SNCC family and compaqeros, feel about each other. REECE McMILLAN: Granddad, what made to join the civil rights movement? JULIAN BOND: It was tremendously exciting, because we felt we were doing wonderful work. We felt we were changing the country for the better, and that even though it was hard work and sometimes dangerous work, we were happy to do it and eager to do it. And I'm still very close to the people who did that with me today, even closer than I am with the people I went to high school or college. I'm closer with the people I was in the movement with. A great oak has fallen, reverberating across all the roots that bind us. And so as the SNCC family prepares ourselves for today's scattering of Julian's ashes in the Atlantic....we work to strengthen our bonds by remembering to cherish we who are still standing. Equally important is to continue to mentor the generations coming behind us. In doing so we will comfort each other in our loss and do Julian proud. About 30 of us gathered at the Charles River in Boston yesterday and placed our flowers in the river at 3 pm EST. Janet Moses and Chuck McDew called us together, other Movement veterans included Dorothy Burlage, Penny Patch, and Claire O'Connor. We were young and old, and included Moses grandchildren as well as other young ones. We spoke, we sang and we remembered Julian. Remembering Julian, Paul and I drove up Mount Lemmon to Rose Lake yesterday, listening to Leonard Cohen's song "Born in Chains". I took the petals from a dried bouquet of roses from Amma's darshans and from my children's gifts on Mother's Days past. We arrived at exactly the appointed hour and scattered the flowers at the far end of the lovely, isolated body of water. The silence, and the floating flowers. A beautiful moment with all my friends and comrades who loved our Julian so much. Thanks to his family for their generosity in engaging us together at this time for this healing ritual. May all beings benefit. One for each decade you gave. Your death cuts it all like a knife. Your forebearers brought in slave ships. Goodbye Julian, it's been quite a trip. I was airborne en route to Martha's Vineyard at 3pm so I raised my martini and festooned it with rose petals I brought with me. I took a strong drink and toasted JB. He would probably have flashed his wry smile. What a beautiful description of your flower ceremony! And I could just see you doing it, too! Your "Soul on Rice" brought a smile to my face. We all know that Julian was funny as hell, so I can understand why he would mention this. I remember, too, when you said your proposed title at the SNCC 50th conference National Office panel ... and the audience cracked up. What Bro. Ed said is perfect: "The circle has grown smaller, but will neverf be broken." You got that right!! On Saturday I walked the eight blocks to Riverside Drive and the Hudson River, after buying a single very bright pink rose for $2. Unfortunately I was a little late but I was hoping that the ceremony in Florida went according to CPTime and that if it was 3:08 Eastern, I was okay. I peered very carefully into the dark green/brown water, looking for obnoxious items (did not want to drop the rose into that) and saw only two branches and a large brown leaf floating peacefully in the water, so I threw the rose down into the water and stood there for about 10 minutes watching the current carry it away uptown and out of sight. The runners and bikers and sitters on benches reading their newspapers and their kindles did not notice that I had thrown anything in the river. I am hoping that the rose went all the way up to Harlem and the George Washington Bridge before going under. For 53 years Julian was my co-worker, my friend and my confidante. I totally appreciate all the recounting of what we did to honor Julian and his legacy and to be in connection with his family and all my SNCC comrades through the process. My daughter Keisha (who met Julian several times, including being invited to sit at his table when the NAACP banquet was held here) and I went to the Broadway pier in the Baltimore Harbor — the same place that the Middle Passage ceremonies were held in Baltimore three Augusts ago. There, at the appointed hour, we scattered flowers from my garden — black-eyed susan's (the Maryland state flower), Crepe Myrtle blossoms (I am certain Julian must have had one in a yard at some point in his life) and petals from a pink rose while we shared our recollections as well as sadness at his sudden passing. Rest in peace and power, Julian. As remembered by Russell C. Campbell Sr.
During the early years of my involvement in the movement (1961-1965), Julian and I worked together in Atlanta. I am the custodian of the minutes of the founding of the Atlanta "Committee on Appeals of Human Rights" which was the basic of the Atlanta Student Movement. Lonnie King, Julian Bond, Frank Smith, and others worked on the document which was the foundation of what we did in Atlanta. Julian was my handler and served on several protest. Over the years we would occasionally bump into each other in DC due to the fact he lived and worked in Washington DC and taught at American University and I lived in Maryland . He would have his students reach out to me for interviews during Black History Month. The last time we spoke was during the 50th anniversary of the March on Washington, 2013. We attended a panel discussion featuring the family of Travon Martin and the cousin of Emmit Till. This event was held at my church, the Shiloh Baptist Church in Washington DC, the eve before the march. I ask Julian, 'You think we have one more march in us?' He said, "Not me, I'll be sitting on the podium." The next day it was raining and he was sitting on the podium out of the rain. He made sure I at least had a sit-in the rain. He will be greatly missed.